a non-profit organization, is to facilitate basic music education. Our primary focus is on the youth of the community but all are welcome and encouraged to participate. The Conservatory offers private music lessons at a reasonable cost and grants scholarships to children in need, providing free lessons and instruments. The study of music enriches the life of the student as well as the community and society. The Silverlake Conservatory of Music is the music school that Flea set up to help all students, no matter their background, in the Los Angeles area to get affordable music lessons. 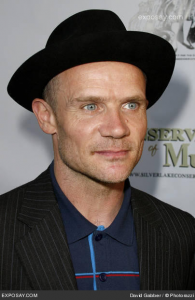 Music had been the salvation of Flea’s life and he believed that everyone should have access to learning it but after visiting his old school, Fairfax High, he found out that music lessons were about to be axed due to budget cuts. Around the same time, his experience as a guest conductor at the Junior Philharmonic Orchestra of California and inspiration gathered from reading the autobiography of jazz pianist, Horace Tapscott, lead Flea to the idea of setting up a music school that offered affordable lessons to all. This dream was realised in2001 when he set up the Silverlake Conservatory of Music with his friends Pete Weiss and Keith Barry. Since then, Anthony Kiedis, among others, has joined the Board of Directors. The school runs several fundraising events a year such as their annual Hullabaloo concert plus one off events e.g. Flea ran the L.A. Marathon to raise funds in 2011and there was a fundraising meal with Anthony Kiedis & Flea a couple of days before.